This page is dedicated to the memory of Walter Edward Pearson, a student and a friend to Grand Master Min and his staff and students. Each year, one student deserving of the Walter Pearson Memorial Award, is celebrated for his/her achievements displaying good attendance, attitude, respect, leadership, motivation, and a team player. This award began December of 1998 because of Walter's courageous story with Taekwondo and his life-ending battle with cancer. 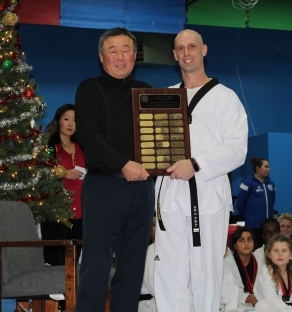 Here is his unforgettable past with Grand Master K. H. Min Taekwondo. As lunch time classes were running daily, Walter would come in and watch from our 2nd floor viewing gallery as other adults would kick, learn Self-defense, spar, etc. Wishing he as an older man could participate as well, Walter would come in every lunch hour at the same time and watch the other adults participate in Grand Master Min's class. Finally, after noticing Walter on a daily basis, Grand Master Min had waved Walter down and invited him into his class. Walter insisted that he could not keep up, but was entertained through watching others participate. Grand Master Min continued to insist that Walter would be able to participate and encouraged him to try to do as much as he could. Since Walter truly did want to join class, he eventually came around to join our dojang and participate as a White belt student. In the beginning he could not do any more than 5 minutes in the class. Feeling fatigue, tiresome, and exhaustion, Walter would always try his best to participate, and would sit out as needed. Yet in a matter of months, Walter was capable of taking the full hour of lessons, as he conditioned and strengthened his body to be a Martial Artist. FOR BEING THE 2017 WALTER PEARSON MEMORIAL AWARD RECIPIENT!